Ever felt really free? Down in the water, there’s almost no gravity! It’s like being in space in a colorful and surreal world. Absolutely addictive! On our website www.goanddive.com we present you the best and most professional dive school in Thailand and whole Asia! Diving with Dive Point Koh Tao is a worthwhile investment. 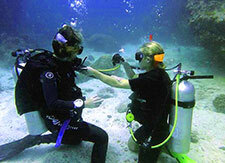 For little money we show you this new world and teach you the most incredible and exiting Hobby “scuba diving”! Try our great Discover Scuba Diving program or our Open Water Diver Course in whatever language you like. We also not only give you four dives (which is the standard) but six dives! But well..ok...You may think "scuba diving isn’t for me.. it must be dangerous and expensive and hard to learn".. But we tell you: “No! It's not! And why not give it a shot - if you really don't like it, you can stop anytime and get your money back”! Trust us - it’s a sport almost everybody can enjoy. The age doesn’t matter and you don’t have to be that “sporty” to to be a scuba diver. Our dive school "Dive Point Koh Tao" is not only one of the most successful dive centers on Koh Tao, but in whole Asia. Despite the high quality of training and the worldwide standardized safety procedures, our dive course rates are still one of the lowest in the world. Dive Point Koh Tao is one of the largest Dive Resorts on the island and one of the largest in the world. Our dive school was established almost 15 years ago and since those early days we always cared about our guest and students. Be assured - you’re not just another number. Most new divers are coming every month just before or after the Full Moon Party (Koh Phangan). But even in this time it’s still relaxed and well organized at our place. 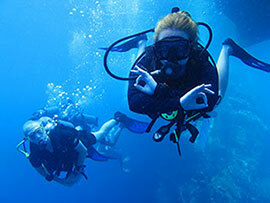 Scuba diving is very easy to learn and it’s incredibly fun. This sport will open you the door to a new, exciting and so different underwater world! Enjoy your new hobby almost everywhere where you go in the world! After all, our blue planet is covered by 70% of water! And when there’s water – you can dive it! Dive Point Koh Tao offers you the benefits of a professional organization and yet you will still have the feeling of intimacy and personal perception.. Your instructor takes his/her time with every student, even when it takes a little bit longer as expected. Don’t worry about that – you are on holidays and you want to have the best time of your life. And that’s our goal – to make you happy! Of course we are an international dive school. We offer courses in more than 15 different languages! Your instructor may be from England, next to you on the boat a Chinese group assembles their equipment and between the dives you have a nice chat on the sundeck with the Divemaster of the Swedish team. You see - you will meet people from all over the world and it’s so easy to get in contact. There are different companies, that issue dive certifications and that supervise and monitor a dive school. 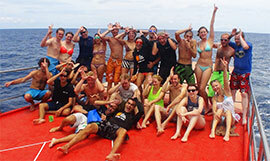 Again, we only offer you the best: SSI courses - which are the highest and most recognized dive courses in the world. Your OWD (Open Water Diver) course will take four days and it will allow you to dive up to a depth of 18 meters on the last day. You will learn very interesting things about dive theory and dive equipment. Furthermore you will practice so called “dive skills”, before we go deeper into the ocean. You will do four (!!!!) 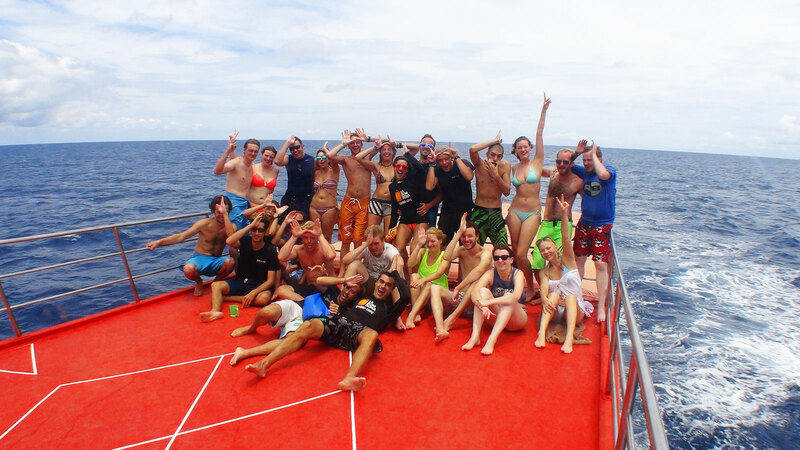 awesome dives with us on the beautiful reefs of Koh Tao and we promise you the best time ever! Sorry! Now you are addicted! Addicted to the sea! But we can help you and give you more of our “drug” - with two additional days you can do an advanced course, including five more dives. This five new dives include far less standard skills than in the Open Water Course and focus on individual topics such as the deep dive, where you go down to 30 meters. Also a night dive is part of the course and will give you a completely new and different view to diving! You’ll be a better diver and love scuba diving even more after this advanced course. Interested in this awesome opportunity? Cool! Just contact us! And if you have any questions about Koh Tao, diving or booking with us – don’t hesitate and text us. Interested in motorbiking? Visit our friends store for retro motorcycle clothing. Marco is one of our top Instructors. He just loooooooooooves to dive on (or better "below") Koh Tao!